Commemorate last year's summer vacation and get yourself excited for this upcoming season! 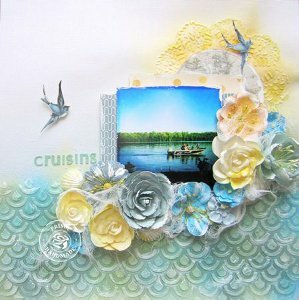 The Beautiful Cruising Scrapbooking Layout is a gorgeous layout that uses contrasting yellows and blues to create a summery look. Soaring birds and Prima flowers add feelings of warmth and happiness. This video tutorial demonstrates the unique techniques used to get that wavy effect at the bottom of the page as well. Reminisce about great summer memories and create a marvelous scrapbook layout to document them. Find this layout and more in our popular collection: Scrapbooking Layouts: 20 of Our Favorite Scrapbook Page Ideas. You will love these beautiful ideas! This one is for those who have gone cruisin'. It could be a Caribbean cruise, a Mediterranan cruise, a Scandinavian cruise, an Alaskan cruise or an Asian cruise, what the heck, do it like they tell you how to do it here. Thanks for the idea. This is a beautiful beach scene. I have just started this but put on canvas. I have not done a scrap booking page yet but this is the encouragement to get started. This video shoes the steps so beautifully and makes it seem to be easy to accomplish. I will be using this theme. Do you not need to use something to preserve the page? Do Not fall for this"free" scrapbook kit! It's NOT free! DO. NOT. fill out all the info for the FREE scrapbook kit. They take all your cc info first and then try to make you join their club for $30.00. Hi Rae, This scrapbook layout tutorial is a free project. I believe you are referring to an advertisement on our site. Like radio and television, we are supported by advertising. Advertising on our site is often placed by a national network such as Google, Glam Media, and Meredith, among others. Typically our advertisers are also advertising on television. We take your issues seriously. Patterns of complaints are reviewed weekly by our operations team and may lead to future advertising reviews. We appreciate the time you took to comment.